The Internet has long been the "Wild Wild West" when it comes to political discourse. But what transpired online this week has triggered a firestorm of outrage -- and an investigation by the Secret Service. The social networking site Facebook on Monday pulled a third-party application that allows users to create polls after a site member built a poll asking if President Obama should be killed. Disclosure of the poll has prompted the Secret Service, the agency assigned to protect the president, to launch an investigation. Meanwhile, the right-wing online magazine Newsmax posted an incendiary column on Tuesday that predicts a military coup against the president -- a real-life version of a scenario chillingly dramatized more than 40 years ago in the motion picture "Seven Days in May," which hit the theaters when Lyndon Johnson was president. Newsmax quickly pulled the column from its Web site -- but not before the media watchdog site MediaMatters.org captured a copy of the column and posted it on its own Web site. Taken together, these developments are the strongest signs yet that there are people on the Far Right who have become completely unglued by the reality of America having a black man as president and commander-in-chief of the armed forces and they are plunging headlong into outright paranoia by launching an increasingly hysterical campaign of hatred against Obama. Such hysteria would easily be dismissed as the rantings of crackpots -- except that it has reached such a fever pitch among a significant portion of the American populace, it is rapidly creating a dangerous climate that can lead to an outbreak of the kind of devastating political violence this country has not seen in almost half a century. WASHINGTON -- The Secret Service has determined that a juvenile was behind the online survey that asked whether people thought President Obama should be assassinated, an agency spokesman said Thursday. No criminal charges will be filed against the juvenile or the juvenile's parents, spokesman Edwin Donovan said. Donovan would not identify the names of the child or parents or say where they are from. After Secret Service agents met with the child and the child's parents, they determined there was no intent to harm the president. "Case closed," Donovan said. "I guess you could characterize it as a mistake." The online Facebook poll asked readers "Should Obama be Killed?" -- accompanied by a mock book cover featuring a photograph of the president with his name printed in the Cyrillic alphabet used in Russian and other Slavic languages, an apparent play on a widespread belief among many of Obama's right-wing opponents that he is a Soviet-style communist. Facebook readers were asked to answer "yes," "no" "maybe" or "if he cuts my health care." The poll, which was posted on Saturday, was flagged on Sunday by a blogger at The Political Carnival Web site who uses the online pseudonym GottaLaff. GottaLaff snapped a "screen grab" -- an online copy of the poll -- and posted it on the Carnival site. "Okay, that's it, I've had it," wrote the blogger, whose real identity is a closely-guarded secret but is a California woman, according to her profile. "The hate speech, the threats have gotten completely out of hand. And those who have incited viewers and listeners -- and you know who you are, Glenn Beck, Bill O'Reilly, Rush Limbaugh, Fox News, etc. -- are responsible for a good part of this horrific activity. "No, it is not 'grassroots,' not even close," GottaLaff continued. "It is a sick, terrifying, dangerous movement toward violence and the worst kind of civil unrest." GottaLaff contacted the Secret Service and urged her readers to do the same. On Monday, she reported that the Secret Service had called her back "to thank me for my screen grab of the poll, and said without it, they wouldn't have been able to address the matter." In an interview Wednesday with CNN, Facebook spokesman Barry Schnitt said the Secret Service informed the social-networking site of the poll on Monday and asked to have it taken down. Facebook allows third-party developers to create applications -- such as polls and quizzes -- which are then made available to Facebook users, who use the applications to create specific content. Users may choose to make their content available to the general population of Facebook or limit it only to their friends. 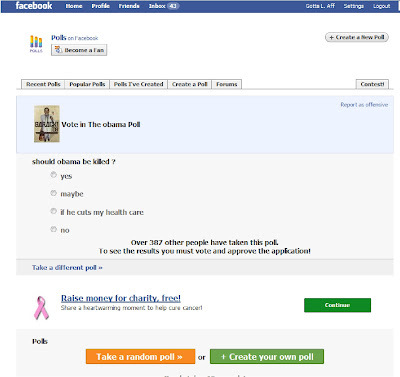 In the case of the "Kill Obama" poll, according to Schnitt, the user made the poll asking whether Obama should be killed available to the general public. The application "was immediately suspended while the inappropriate content could be removed by the developer and until such time as the developer institutes better procedures to monitor their user-generated content,"Schnitt said. The Facebook spokesman credited GottaLaff and other users of the social network with alerting the site about the poll. "As is usually the case, our vigilant users reported it to us first," he said. By the time the Secret Service contacted Facebook, "it had already been removed, and we let them know," Schnitt continued. Disclosure of the "Kill Obama" poll is only the latest development in an unprecedented spike in death threats against the president that has stretched the Secret Service to the limit of its ability to protect Obama and his family in the more than nine months since he took office. As reported in August, the rate of threats against the president has soared by 400 percent from the 3,000 reported threats a year or so under former President George W. Bush, according to author Ronald Kessler. In his book, In the President's Secret Service, Kessler reports that some threats to Obama already have been publicized, including an alleged plot by white supremacists in Tennessee late last year to rob a gun store, shoot 88 black people, decapitate another 14 and then assassinate the first black president in American history. Most threats, however, are kept under wraps because the Secret Service fears that revealing details of them would only increase the number of copycat attempts. Although most threats are not credible, each one has to be investigated meticulously. In a column that touched off an Internet firestorm, Newsmax columnist John Perry wrote that "There is a remote, although gaining, possibility [that] America’s military will intervene as a last resort to resolve the 'Obama problem.' Don’t dismiss it as unrealistic." What did Perry mean by the "Obama Problem?" He calls it "Obama’s exponentially accelerating agenda for 'fundamental change' toward a Marxist state." In other words, Obama is a communist and setting the country on a path toward Soviet-style communism -- a path that Perry predicts many in the military will not tolerate. Perry continues: "Top military officers can see the Constitution they are sworn to defend being trampled as American institutions and enterprises are nationalized. They can see that Americans are increasingly alarmed that this nation, under President Barack Obama, may not even be recognizable as America by the 2012 election, in which he will surely seek continuation in office. "They can see that the economy — ravaged by deficits, taxes, unemployment, and impending inflation — is financially reliant on foreign lender governments," Perry writes. "They can see this president waging undeclared war on the intelligence community, without whose rigorous and independent functions the armed services are rendered blind in an ever-more hostile world overseas and at home." "They can see the dismantling of defenses against missiles targeted at this nation by avowed enemies, even as America’s troop strength is allowed to sag," Perry goes on. "They can see the horror of major warfare erupting simultaneously in two, and possibly three, far-flung theaters before America can react in time. They can see the nation’s safety and their own military establishments and honor placed in jeopardy as never before." Perry cautions that "America isn’t the Third World. If a military coup does occur here, it will be civilized. That it has never happened doesn’t mean it won't." Twenty-four hours after it posted Perry's column, Newsmax pulled it. The direct link to Perry's column instead defaults to the right-wing outlet's home page. But not before MediaMatters grabbed a screenshot of Perry's column and posted it on its own Web site as a PDF document. Newsmax makes no reference to the controversial column on its home page -- neither an explanation of why it was pulled nor an apology for its content. But in a statement sent to MediaMatters, a Newsmax spokesperson said that in writing about a possible military coup, Perry "clearly stated that he was not advocating such a scenario but simply describing one." The spokesperson said that Newsmax pulled the Perry column "after several reader complaints." The spokesman said the site "wanted to insure that this article was not misinterpreted." The spokesman went on to say that Newsmax "strongly believes in the principles of Constitutional government and would never advocate or insinuate any suggestion of an activity that would undermine our democracy or democratic institutions." The spokesman insisted that Perry, who served as a political appointee in the Carter administration, "has no official relationship with Newsmax other than as an unpaid blogger." The coup that Perry outlined in his column is eerily reminiscent of one of Hollywood's most gripping political thrillers, "Seven Days in May," a 1964 Cold War melodrama that starred Kirk Douglas and Burt Lancaster about a U.S. Army colonel (Douglas) who discovers that a four-star Air Force general (Lancaster), was plotting a coup to overthrow the president and establish a military junta after the president reached a nuclear-disarmament treaty with the Soviet Union. After warning the president of the plot, the colonel -- in spite of his own opposition to the treaty -- had just seven days to head off the complex and elaborately planned coup. The upshot: The president in the film was named Jordan Lyman (played by Frederic March) -- an anagram of the real-life President Lyndon Johnson, who made nuclear disarmament with the Soviets a major plank in his successful campaign to win a full four-year term in 1964 after succeeding the assassinated President John F. Kennedy the year before. The general in the movie was portrayed as a right-wing "superpatriot," who, in a direct face-to-face confrontation with the commander-in-chief in the Oval Office, accused the president of leading the country to a disastrous surrender to the Soviets through the treaty he reached with Moscow. For some of those old enough to have lived through the Cold War, "Seven Days in May" was a far more serious melodrama than the two other major Cold War films that also came out in 1964, "Dr. Strangelove" and "Fail-Safe," both of which dealt directly with the nightmare scenario of a direct military confrontation between the U.S.A. and the U.S.S.R. The Cold War's been over for 20 years. But the possibility of a military takeover of the U.S. remains a scary thought. Can you believe their chutzpah? Just who are Rush Limbaugh and Glenn Beck trying to impress with their wild, unprovable claims that President Obama is a big, badass black boogeyman who's out to make life miserable for white people in this country? Has Limbaugh's admitted past addiction to OxyContin and other prescription drugs driven him totally paranoid? Has Beck's own admitted past addiction to cocaine and alcohol similarly pushed him over the edge? Or have America's two most visible and controversial right-wing pundits come totally unglued by the changes in America's political and social landscape that they both know they cannot stop? It's indeed a blessing that Obama is as cool as a cucumber. Rather than take Limbaugh and Beck's racially-charged bait, the nation's first African-American president has ignored them, instead moving on with the same calm demeanor of optimism that won him the presidency at a time when America is facing its worst economic crisis since the Great Depression. Indeed, it would be very un-presidential of him to do otherwise. But it would be the height of irresponsibility at best -- and outright enabling at worst -- for anyone else to either ignore or dismiss as "boys will be boys" the racially-charged venom that Limbaugh and Beck are injecting into the public discourse. We absolutely don't buy Limbaugh's lame excuse that he's merely an "entertainer" and his rants are merely sarcastic parodies. As we said in an editorial last week, that's a crock of pure, unadulterated B.S. What Limbaugh has done -- and continues to do -- is ugly and poisonous. Indeed, it is beyond ugly. It is beyond poisonous. Limbaugh and Beck have crossed the line into deliberate race-baiting that, in the opinion of The 'Skeeter Bites Report and many others -- including a growing chorus of conservatives -- a flat-out abuse of the First Amendment's guarantee of free speech. The time is long overdue that they be held accountable. Limbaugh and Beck also crossed a line into outright slander and defamation of character, for which both clearly deserve to be sued in a court of law. Limbaugh's claim that the president is an Arab was a thinly-disguised attempt to demonize the president as a Muslim, when in fact, he is a Christian. In making that comment, Limbaugh gave tacit --if not overt -- support for the "birther" movement, which insists -- despite overwhelming evidence to the contrary -- that Obama is not a native-born U.S. citizen but a native of Kenya, his father's homeland. He also, whether consciously or unconsciously, stoked the rabid Islamophobia of so-called "Birther Queen" Orly Taitz, whose ties to a radical Jewish extremist group that considers Obama a threat to Israel were exposed by The 'Skeeter Bites Report on September 7 and whose latest lawsuit against the president was thrown out as "frivolous" by a federal judge -- ironically, an appointee of Obama's predecessor, George W. Bush..
Beck's accusation that Obama "is a "racist" with "a deep-seated hatred for white people or the white culture" was a clear attempt to stoke the passions of rabid white-supremacists. 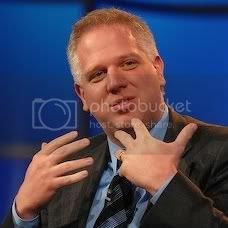 It was also so patently false and defamatory toward the president that the only reason Beck hasn't been sued is that the president, being the nation's chief executive as well as a public figure, cannot take legal action against Beck -- or anyone else -- until after he leaves office and becomes a private citizen. LIMBAUGH: SEGREGATE BUSES -- ROSA PARKS AND FEDERAL LAW BE DAMNED! Limbaugh went over the line when he called for the re-segregation by race of school buses. "We need segregated buses," he said, commentating on an incident aboard a school bus on September 15 in which a white teenager was attacked by two black teens. Seizing upon the incident to fire yet another slam at President Obama, Limbaugh said, "I think not only it was racism, it was justifiable racism. I mean, that's the lesson that we're being taught here today. [The] kid shouldn't have been on the bus anyway. We need segregated buses -- it was invading space and so forth. This is Obama's America." One big problem with that, Rush: Segregation by race on buses and other public accommodations is illegal. It's been illegal for more than half a century. But apparently, Limbaugh doesn't care about that. Nor, apparently, does Limbaugh care about the long struggle by African-Americans to end the practice that began in 1955 when Rosa Parks, an African-American seamstress, refused to obey the bus driver's order that she give up her seat at the front of the bus to a white passenger and move to the back of the bus where blacks were required to sit. Parks' act of defiance became an important catalyst to the modern civil rights movement with the subsequent launch of the Montgomery bus boycott, led by a young African-American minister named Martin Luther King, Jr. The boycott launched King into national prominence in the civil rights movement and made Parks an international icon of resistance to racial segregation. The Federal Communications Commission takes a dim view of broadcasters using the radio and TV airwaves to openly advocate breaking the law, but is generally powerless under the First Amendment to do anything to stop them -- unless they openly incite violence or the violent overthrow of the government, the latter of which is illegal under the federal Smith Act of 1940. While neither Limbaugh nor Beck have gone so far as to advocate the violent overthrow of the government -- yet -- one has to wonder how much longer will it be before they cross that red line. BECK INFLUENCED BY 'CRACKPOT' CONSPIRACY THEORIST? This isn't the first time that Beck has gotten himself in trouble over racially-charged remarks. In fact, Beck has been playing the "race card" on the radio for years. Conason also writes that Beck is a devotee of author and conspiracy theorist W. Cleon Skousen. "Among Skousen’s pet theories was that Southern slave owners were actually the victims of the plantation system, which according to him, favored the lazy and pampered slaves, whose children he called 'pickaninnies.'" Does that mean Beck is a bigot? "If Obama had ever endorsed the writings of Louis Farrakhan,"Conason wrote, "replete with vile slurs against whites and especially Jews, that would certainly be enough for Beck -- who says he believes that the president has 'a deep-seated hatred for white people, or the white culture.' That must be why the Obama White House has so many whites of all ethnic and religious backgrounds advising the president, from the Cabinet down." Beck's increasingly bizarre comments are drawing ire from a growing number of conservative commentators. Lat Tuesday, MSNBC morning host Joe Scarborough, a conservative former Republican congressman, lashed out at Beck, telling viewers, "When you preach this kind of hatred, and say that an African American president hates all white people -- hates all white people, you are playing with fire. And bad things can happen. And if they do happen, not only is Glenn Beck responsible, but conservatives who don't call him out are responsible." Scarborough went on to say that he was starting an "honor roll" of conservatives willing to come out against Beck. He made multiple references to Beck's "race-baiting," and "wallow[ing] in conspiracy theories." Other conservatives, however, are going after Beck's assertion made during an interview with "CBS Evening News" Anchor Katie Couric on her new Web-only program that John McCain would have made a worse president than Obama -- apparently coming to the realization that Beck is a totally unpredictable "loose cannon" whose growing popularity with the radical right-wing fringe is posing a direct threat to the mainstream conservative movement. A "loose cannon" who apparently doesn't care for an African-American being president of the United States. Make that two "loose cannons."